SECURITY - Our cloud-based platform is built using leading cloud provider safeguards to protect client data. Data is protected at rest and in transit and stored in highly secure partner data centers. Thanks to encrypted technology architecture, access is only available to hospital patients. COST EFFICIENCY - By moving many services to the cloud, our solution reduces the high cost of space, power, cooling, and personnel costs associated with operating and maintaining local hardware. AGILITY - A cloud-based product environment allows us to continuously improve and grow the ZOTT product. It also reduces the time it takes to deploy new features, update security, or add new content from weeks to just minutes. RESILIENCE - Beyond traditional disaster recovery, our cloud-based platform provides strong resilience to outages and data loss by distributing applications and data across secured data centers and geographies. 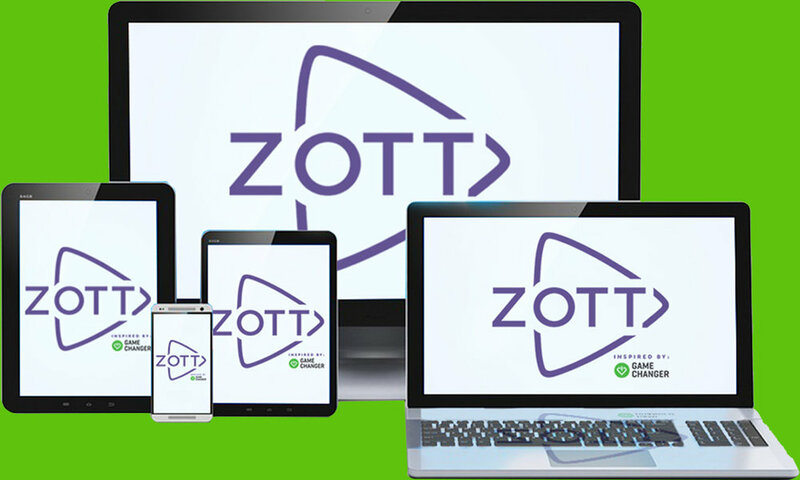 ZOTT utilizes a BRING-YOUR-OWN-DEVICE model that reduces support and maintenance costs for hospitals while allowing access to our content anywhere in the hospital environment. 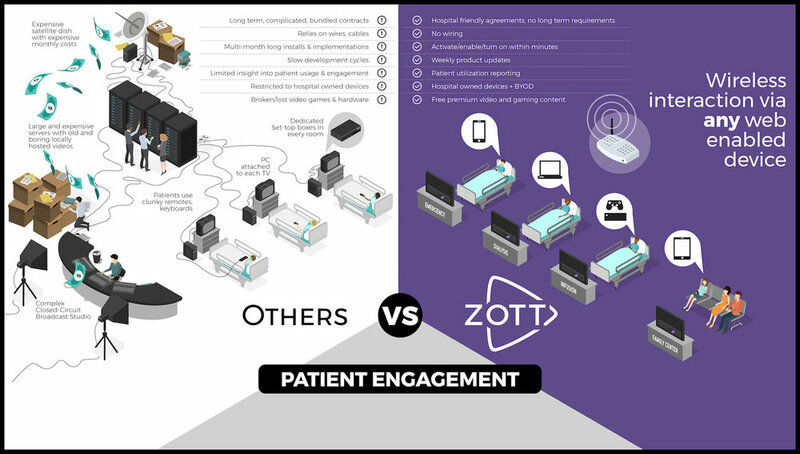 After ZOTT has been implemented within a facility, anyone within the hospital can consume content through their preferred device without worrying about wires or restrictive hardware. 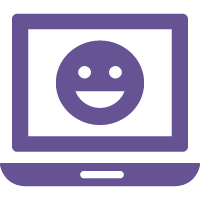 Our platform is broadly compatible with popular browsers, devices, and operating systems. Live TV, premium movies, original live streaming content, and curated short-form videos can be streamed to Apple and Microsoft Windows-based computers, iOS and Android tablets, or smartphones. The ZOTT platform uniquely blends the best cloud-based and deployed server appliance technologies to strike a refined balance across performance, edge network resources, on-premises footprint, and overhead management for our clients. ZOTT creates a safe space for patients and families enabling a walled-garden experience through a combination of privacy, curation, and moderation. Inside this walled garden we provide opportunity for entertainment, play, learning, and socializing - fostering a sense of community and togetherness through safe meaningful interactions. LIVE STREAMING - The most popular streaming channels and stars, plus exclusive streams for our patient communities. LIVE TELEVISION - Watch popular networks live, including local stations, family-friendly networks and live sports, powered by DIRECTV. PREMIUM MOVIES - Huge catalog, unlimited viewing — including new releases, family-friendly films and documentaries. 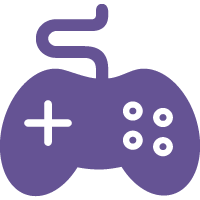 GAMES - A curated selection of popular games you can play on your devices. CURATED YOUTUBE LIBRARY - ZOTT’s team of content curators manually vets and uploads hours of fun, trusted video content daily across a range of interests. SOCIAL PLAYGROUND - Built exclusively for hospitals, ZOTT’s social gaming community allows patients to play, learn, and form friendships in a secure, safe environment. LEARNING - Lessons in math and science, software coding and music instruction mean there’s always a lot to discover and learn. CLINICAL OVERVIEWS - With the support of comic book creators and clinical animation producers, we’ve helped make understanding illness and treatment clearer and much less scary. MUSIC - Songs, videos, exclusive artist interviews, music lessons, and in-hospital concerts by popular artists across genres. Our content community is growing! Our friends at Methodist Children's Hospital in San Antonio have been using ZOTT to live stream their weekly bingo games and other events to their patients. Did You Know? 41% of patients would switch hospitals for a better patient experience. How can the hospital experience be made a little easier for patients and their caregivers? We are excited and honored to announce that ZOTT is being implemented at UCSF Benioff Children’s Hospital.